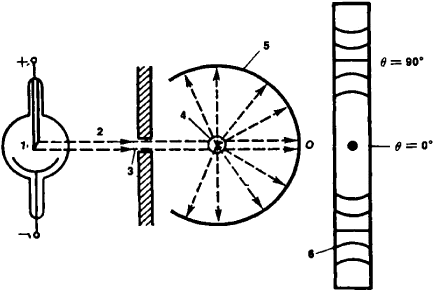 An x-ray diffraction method in which the sample, consisting of a powder stuck to a thin fiber or contained in a thin-walled silica tube, is rotated in a monochromatic beam of x-rays, and the diffraction pattern is recorded on a cylindrical film whose axis is parallel to the axis of rotation of the sample. Figure 2. X-ray diagraph of graphite obtained by the Debye-Scherrer method with the aid of an ionization spectograph with monochromatic Kɑ radiation of copper (wavelength λ = 1.54 Å). Numbers designate crystallographic indexes of planes of reflection. 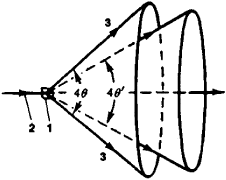 the form of a series of diffraction lines, the shape of which depends on the geometry of X-ray photographing—namely, the mutual position of the sample, photographic film, and incident X-ray beam. The film in some cameras that are used for making roentgenograms of polycrystals is placed on the surface of a cylinder, the axis of which is at right angles to the incident X-ray beam, and the sample is placed on the cylinder’s axis. The arrangement of instruments used in this type of recording is schematically shown in Figure 3. Figure 3. Diagram of the making of a roentgenogram by the Debye-Scherrer method: (1) X-ray tube, (2) beam of monochromatic X rays, (3) diaphragm (slit), (4) crystal, (5) film, and (6) X-ray spectrum. O is the trace left by the beams passing through crystal. In other cameras the flat film is placed at right angles to the incident X-ray beam so that the beam, which passes through the sample without diffraction, falls onto the center of the film. This method records the full Debye ring, that is, the curve of intersection of the diffraction cone with the photographic film. Powder patterns of this type are usually used for determining the texture (the predominant orientation of crystallites). Measurement of the apex angles of the cone makes it possible to determine the interplanar distance d using the Bragg-Vul’f equation. In some cases, these data, together with the measurements of the X-ray intensities in each diffraction cone, are sufficient for the complete determination of the crystal lattice structure. The Debye-Scherrer method is of particular importance for the solution of various technical problems. For example, it may be used for the study of structural changes arising during various treatments of metals and alloys. In the case of plastically deformed crystals, this method makes it possible to determine the presence of the texture in the sample and during heat treatment to observe phase transitions. The Debye-Scherrer method is also widely used in mineralogy and chemistry for the identification of various minerals and chemical compounds. Non-deformed and recovered samples are analyzed by WAXS, using the Debye-Scherrer method .